Seven-year-old Alexandra Ridgemont loves chocolate Yoo-Hoo drinks and the lobster tank at the supermarket in the small Indiana town where she lives with her archaeologist parents. The lobsters are the same bright red as her hair. But the lobsters are sad. They always beg her to let them out of the tank. Alex ignores them. At least until the day she meets Blue Eyes – a boy her age with sandy blond hair and stunning blue eyes who tells her she smells like lemons and becomes her first and only friend. Alex shares her Yoo-Hoo with Blue Eyes and enlists his help to set the lobsters free. Except live lobsters aren’t red. And her mother says she never let any lobsters out of a tank. And Blue Eyes vanishes, never to be seen again. Seventeen-year-old Alex is used to the delusions and hallucinations caused by her early-onset paranoid schizophrenia. Those suspicious looking squirrels holding a conference on the lawn are probably Communist spies. But, since Alex isn’t sure whether they’re real or a product of her imagination, she’ll take a picture of them. If they’re hallucinations, they’ll eventually fade from the photo. If they don’t, then she’ll know they were real. It’s vital for Alex to teach herself to distinguish between her hallucinations and reality. She desperately wants to go to college. She can’t afford to have another episode like the one that got her kicked out of her last school. She also can’t afford for anyone at her new school to find out about her illness. Alex is doing fairly well at appearing normal. She has a part-time job and one of her new coworkers, Tucker, attends her new school. At least she’ll have someone to talk to when she arrives. So far, so good. Until Miles walks into the restaurant where Alex works. Miles, who has sandy blond hair and eyes the same riveting shade as Blue Eyes. They couldn’t be the same person. Could they? She just imagined Blue Eyes. Didn’t she? I discovered Francesca Zappia’s debut novel, Made You Up, on a recent trip to my local library. I hold a degree in English with an emphasis on creative writing so I’ve had to read, write, and critique a lot of stories. One semester, after workshopping a mediocre story told in first-person POV about a protagonist with a mental illness, my professor remarked that one of the most difficult things to do as a writer is to tell a story in “first-person crazy” (her words) without overwhelming the reader. 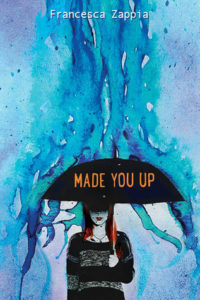 So, upon reading the cover blurb for Made You Up, I was immediately intrigued. Here was an author who had written a novel in “first person crazy” well enough to land a contract with a traditional publisher. I had to read it. I have to admit, I was impressed. Ms. Zappia manages avoid the pitfalls of info dumping or bogging down her reader with the details of Alex’s inner world. Alex’s hallucinations are woven into the fabric of the story until they seem almost commonplace. Unfortunately, this is also the biggest drawback of the story. Alex has grown so accustomed to her hallucinations and paranoid delusions that they seem to be nothing more than a minor inconvenience. Even when Alex is in the throes of a full-fledged psychotic break, her inner monologue seems calm and rational. Other characters are only slightly fazed by Alex’s screaming and raving. Alex’s new friends take their first experience with her illness in stride with the sort of attitude one might expect of a group of college students caring for a drunk friend who just needs to sleep it off. They don’t seem afraid, repulsed, or to feel much of anything beyond mild curiosity. While I can understand Alex’s family being less perturbed by the symptoms of her illness, since they’ve had years to acclimate, I had a hard time suspending my disbelief where her friends were concerned. While I will be the first to admit I have no idea what it’s like to live with schizophrenia or with a loved one who suffers from it, the lack of emotional turmoil for Alex and her friends just didn’t ring true for me. As much as I enjoyed this book, Alex’s parents seemed to be the only ones who had any genuine feelings about her illness. Despite its few flaws, Made You Up is successful at portraying a smart, funny young woman who is, like every other teenager, just trying to figure out her place in the world. Ms. Zappia manages to tell her story without reducing Alex to a walking cliche, which is a bonus. I recommend getting your hands on a copy of Made You Up. It’s worth reading and I look forward to Francesca Zappia’s future novels.